This is a follow-up post of the first edition of Exploiting hard filtered SQL Injections and at the same time a writeup for Campus Party CTF web4. In this post we will have a closer look at group_concat() again. Last month I was invited to Madrid to participate at the Campus Party CTF organized by SecurityByDefault. Of course I was mainly interested in the web application challenges, but there was also reverse engineering, cryptography and network challenges. For each of the categories there was 4 difficulty levels. The hardest webapp challenge was a blind SQLi with some filtering. Techniques described in my last blogposts did not helped me so I had to look for new techniques and I promised to do a little writeup on this. The first attempt was to create a working UNION SELECT with %a0 as a whitespace alternative which is not covered by the whitespace regex but works on MySQL as a whitespace. The news article with id=1 is shown when the first letter of all concated table names is ‘a’, otherwise news article with id=2 is shown. As stated in my last post the output of group_concat() is limited to 1024 characters by default. This is sufficient to retrieve all table names because all default table names concated have a small length and there is enough space left for custom tables. However the length of all standard columns is a couple of thousands characters long and therefore reading all column names with group_concat() is not easily possible because it will only return the first 1024 characters of concated standard columns of the database mysql and information_schema *. Compared to newer MySQL versions the amount of 187 was relatively small (my local MySQL 5.1.36 has 507 columns by default, it was MySQL 5.0). Now the idea was to only concatenate the first few characters of each column_name to fit all beginnings of all column_names into 1024 characters. Then it would be possible to read the first characters of the last columns (this is where the columns of user-created tables appear). After this the next block of characters can be extracted for each column_name and so on until the whole name is reconstructed. To avoid finding the right offset where the user tables starts I began to extract column name by column name from the end, until I identified columns of the default mysql database (a local mysql setup helps a lot). I think the following graphic helps to get a better idea of what I did. 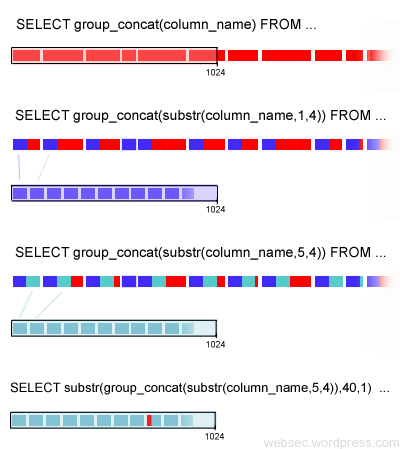 The first SELECT shows a usual group_concat() on all column names (red blocks with different length) that misses the columns from user-created tables that appear at the end of the block list. The second query concatenates only the first 4 characters (blue) of every name to make the resultset fit into the 1024 character limit. In the same way the next block of 4 characters can be SELECTed (third query). Each string of concatenated substrings can be read char by char to reconstruct the column names (last query). In the end I ranked 2nd in the competition. I would like to thank again SecurityByDefault for the fun and challenging contest, especially Miguel for the SQLi challenges and give kudos to knx (1st), aw3a (3rd) and LarsH (the only one solving the tough reversing challenges). By the way the regex filters presented in the last posts are not only for fun and challenges: I have seen widely used community software using (bypassable) filters like these. This is a addition to my last post about Exploiting hard filtered SQL Injections. I recommend reading it to understand some basic filter evasion techniques. In this post we will have a look at the same scenario but this time we will see how it can be solved with conditional errors in a totally blind SQLi scenario. The main difference to the previous source code is that the user/attacker will not see any output of the SQL query itself because the result is only used for internals. However, the application has a notable difference when an error within the SQL query occurs. In this case it simply shows “Error” but this behavior could also be a notable MySQL error message when error_reporting=On or any other custom error or default page that indicates a difference between a good or bad SQL query. Or think about INSERT queries where you mostly don’t see any output of your injection rather than a “successful” or not. If you encounter keyword filtering it is more than likely that timing is forbidden because of DoS possibilities. On the other hand using conditional errors is just faster and more accurate. The most common documented error for SQLi usage is a devision by zero. Accordingly our vulnerable webapp will output “Error” and indicate if the condition (1=1) was true or false. Note that we have to know a table and column name to use this technique. Until yesterday I did not knew of any other way to throw a conditional error under MySQL (if you know any other, please leave a comment!) and from time to time I was stuck exploiting hard filtered SQL Injections where I could not use timing or known conditional errors because I could not access information_schema or any other table. A new way to trigger conditional errors under MySQL can be achieved by using regular expressions (regex). Regexes are often used to prevent SQL injections, just like in my bad filter examples (which you should never use for real applications). But also for attackers a regex can be very useful. MySQL supports regex by the keyword REGEXP or its synonym RLIKE. If the first char of the version is ‘5’ then the regex ‘(‘ will be compared to 1 and an error occurs because of unbalanced parenthesis. Otherwise the regex ‘1’ will be evaluated correctly and no error occurs. Again we have everything we need to retrieve data from the database and to have fun with regex filter evasions by regex errors. You are currently browsing the Reiners' Weblog blog archives for May, 2010.